There are many Miami Beach apartment options that provide a full life of luxury. These three apartments have spectacular views, spanning over two or three levels to provide an elegant and unique living experience. From rooftop pools to secluded bedrooms and walls of glass to incorporate the view, this Miami Beach apartments are amazing examples of luxury living in the area. This Miami Beach apartment for sale has the best view and location of all the options in Miami. The unit is a tri-level penthouse with five bedrooms and seven bathrooms, which is just the beginning of the luxury. There’s also a 7000 square foot rooftop terrace with a private pool, spa, and outdoor kitchen. Inside there are floor to ceiling windows that draw plenty of natural light and showcase the view in an amazing way. There’s a unique spiral staircase to connect the levels, and the bedrooms have great privacy and secluded views. As a Miami Beach apartment for sale this unit has a little bit of everything you’d want in a luxury unit with expansive main rooms, wide views, and private resident quarters. Another amazing Miami Beach apartment for sale is this five bed and five bath unit. The indoor and outdoor space are merged through the use of sliding doors with a beautiful 7,000 square foot terrace that wraps around the interior. This luxurious feature provides amazing flow throughout the unit and brings the view inside, as well as gives residents a private space to enjoy the view and the sun. There’s wonderful glasswork throughout this apartment, providing amazing natural light and a relaxed atmosphere. The white color palette provides a modern and minimal aesthetic which allows residents to customize the space to their liking. 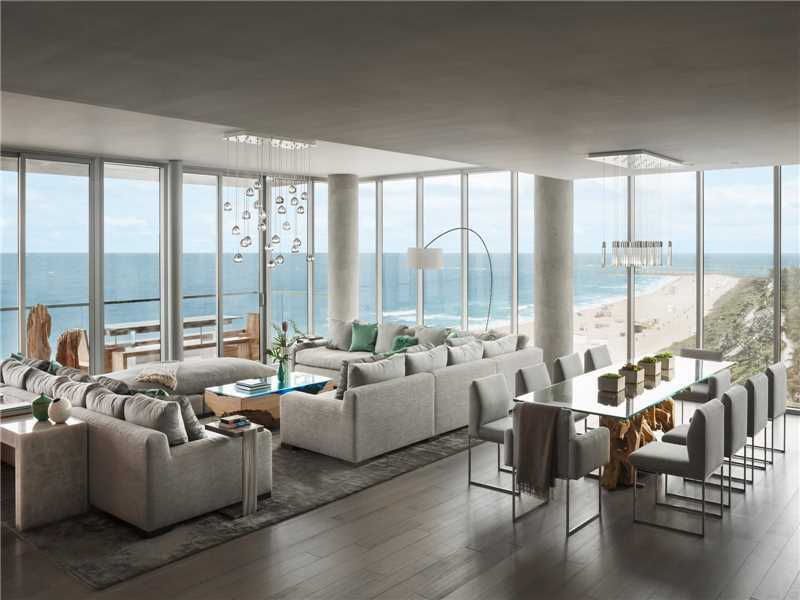 The last Miami Beach apartment for sale is another penthouse, covering 13,000 square feet over two floors. This apartment is located in one of the most popular Miami Beach neighborhoods, South of Fifth, and has amazing views of the beach. There’s an entire wall of windows to capture the view, and it creates a unique living experience through the main space. Outside there is a private rooftop terrace for enjoying the view as well as a pool and spa for relaxing. This Miami Beach apartment for sale is a great example of the luxury lifestyle apartments in the neighborhood provide.